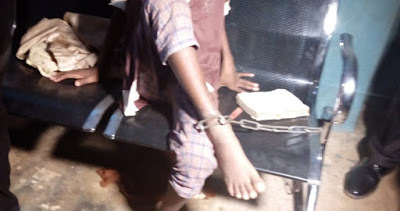 Ogun State Police Command rescued 12 years old, Segun Azeez, who was locked down with big chain and padlocked for three months by his grandmother, Mrs Yemi Kazeem. It was learnt that Segun’s mother, Yomi Kazeem (Maiden name), an auxiliary nurse, and who had parted ways with his father, allegedly provided the chain and padlock with which he was tied to a spot at home for over two months. According to mother and grandmother, the motive is to prevent the boy from fleeing home. The Police Commissioner, Ahmed Illiyasu, led over a dozen armed policemen and Operatives of the Federal Anti – Robbery Squad (FSARS), to a bland bungalow on Ife – Lagba, Obada town, in Ewekoro Local Government Area of Ogun State and set the boy free from the forced incarceration around 4: 48pm on Wednesday. The grandmother, Mrs Yemi Kazeem, was arrested for further investigation. Segun who broke down in tears after being rescued, said his ordeal began in his paternal family in Sagamu, where he alleged, someone charmed him and which made him to detest home and kept fleeing from it. Amid sobs, the boy said he was accustomed to deprivations and hunger which compelled him to stop his education at primary three in Sagamu, adding that when his mother brought him to Obada town from Sagamu, he had thought his sufferings would lessen but unknown to him it was just a continuation in another dimension. The grand mother, Yemi Kazeem, told reporters that the boy was stubborn and elected to chain him down to prevent him from stealing and further fleeing home. The woman said she suspected that Segun was having spiritual problems and had been fasting and praying so that what troubles him could be evicted. Also, the boy’s biological mother, Yomi Kazeem, said she was not aware that chaining Segun to a stake was a crime, adding that she bought the chain for the purpose of confining him to save the grandmother the stress of searching for him should he flee home. » 9-year-old boy chained by Celestial Church tells his story!